Knowing Your Stuff About A Two Post Lift Can Help You Save! Have you ever wondered how professional mechanics or the average person works on cars where you need to get underneath and in and out of them? Car lifts have done more than just provide easier access to just work on vehicles, but they also provide storage for vehicles, ATVs or smaller type construction machinery. Before looking to buy car lifts, you need to know what you're looking for or what you need because a lot of car lift systems are customized and tailored for the person's need. This means that the variety to choose from just got bigger. The reason why a two post lift came into existence and became quite convenient is when mechanics didn't have the money or ground sufficient enough to have in-ground lifts. The two post lift is a device that is able to hold and hoist a vehicle. 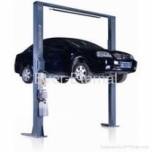 Most two post lifts are electronically hydraulic powered car lifts. They are mounted into the concrete and some heavy duty lift models can hold up to 30000 lbs which would require a thicker concrete foundation for the posts to be mounted into. By using the electronic system box that's located on one of the posts, it activates the hydraulic pistons to raise a diamond plated base plate which are responsible for lifting the vehicle. You can also get portable two post lifts that are light duty and hold about 6000 lbs. When you need an oil change or need to clear up the space when not working on a car, a portable one is the most convenient. A two post lift can come in different models and designs and can hold different amounts of weight. The typical weights (all in lbs) are, 7,000, 10,000, 12,000 to 16,000, 20,000, 26,000 to 30,000. A scissor car lift has a platform on which the vehicle is on and just like the aerial scissor lift, it works the same way, with pressurized hydraulic pistons responsible for lifting the platform with linked criss cross beams. A 4 post hoist has four posts with a platform that the vehicle is mounted on. They are also good to use as a garage car storage lift to save space on unused vehicles. To save money on lift parts, kits, equipments, jacks and suspension kits, it's best to do your research and know exactly what you're looking for and what you need. It can get very expensive. Buying a used car lift and parts are also great ways to save money.